Last week during July 4th celebration, we had an experience that reminded me of my days in the Philippines. You may say, how can be a holiday that is so American (US Independence Day) remind me of my home country, the Philippines? Please stay with me and keep on reading. Our last 4th of July was kind of unusual as we were invited for dinner by our friend to celebrate it with their friend, whom I never met before. We celebrated the holiday in a farm about an hour drive away from our home, in the outskirt of a small town of rural Iowa. We had dinner – burgers, hotdogs, potato salad, and vegetable salad (very American meal) – in a log cabin near a small pond. Then when darkness came we sat in our camping chairs and watched the fireworks that was fired from the nearby town. Even though the setting of the log cabin was similar to a small barrio back home, but that’s not what reminded me of the Philippines. Earlier that day, since it’s a holiday and I wanted my wife to take a break too from the kitchen, so we went out for lunch. We chose a restaurant that is located in a large shopping complex close to our home. After we were seated and only a few minutes after our order was taken by the waitress, the power went out. A blackout! Why do we call it blackout or brownout? Technically the lights are out so it’s black or dark. Should it be “black in?” And is there a difference between blackout and brownout? Many people, including me, think they are synonymous. But according to energy company’s definition, a blackout is a total power outage while a brownout is a partial reduction in system voltage or system capacity. Now I learned something too. 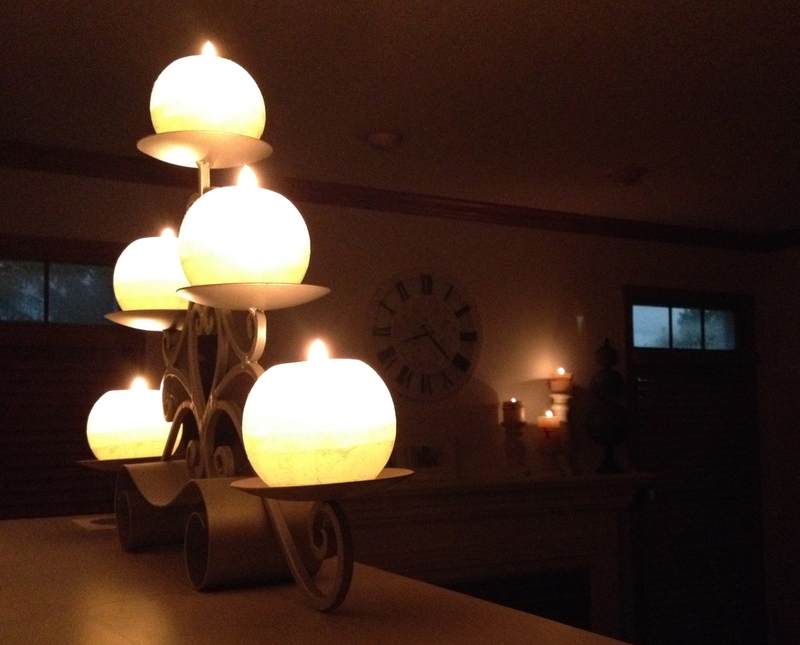 So while we were sitting in the restaurant without power, that brought me back memories of the power outages in Manila. I was reminded of those candlelight dinners we had, not because we were creating a romantic ambience, but because there’s no electricity and yet we need some light so not to swallow the fish bones. Those sweltering heat that all you can do was to fan yourself with the abaniko made of fronds from buri palm. For your information, we don’t have air-conditioning in our Manila home, but we have a few Standard or Hitachi electric fans. Most of the people, at least from our neighborhood, would go outside in the street and hangout in front of their houses when the power is out. No TV to watch any teleserye, and it’s too hot to relax or nap indoors. So no other recourse but to gossip with your neighbors outside while enjoying Manila’s evening breeze. Lahat istambay sa kalye. Those blackouts most of the time, would last one to two hours. And during the 1980’s to early 90’s, we had rolling blackouts or scheduled power outages, to conserve energy as there’s not enough power supply to cope with Metro Manila’s increasing electric need. Or perhaps the government just thought it was a good fad. Sometimes it was not just once a day that we had blackouts, as it could be twice a day or more. With the lights going on and off so often, all business becomes “patay-sindi.” Of course the real “patay-sindi” establishments or the red-light districts just gets darker. And when the power is out, Metro Manila becomes one big sauna place, with its residents sweating profusely that no amount of tawas or Rexona matters. Even hospitals and other vital facilities were not spared from this power outages. Some of the facilities have their own power generator, but even then, their generators cannot supply all their facility’s electric need. So maybe the generators can support the power for the lights, but not the air conditioning or some other functions. When we were 4th year medical students, one of the roles we have was to become human ventilators. One of our sign-outs was the list of all patients in the hospital on mechanical ventilator. So when the power goes out, we all would run to our assigned patients and manually ambu-bagged the patient for the next hour or so, or until the power returns. Squeezing the ambubag for an hour was a good exercise for the forearm though and it strengthens the grip. I just did not realize until then that, that was one of my duties when I signed up for medical school. When the long-awaited electric power finally returns, you could hear a loud hurray and even applause from the whole neighborhood. As if we need to cheer the energy company for restoring the power. It’s like it was our “utang na loob” to have our electricity back. Utang na loob na buhay ‘yan! Back to our 4th of July lunch in the restaurant, as we waited for our food, the waitress told us that our food would be ready soon. They might have gas-powered grills as they can still cook even without electricity. Though it was already starting to get hot inside as there’s no a/c. They did not have to bring out candles though as it was still bright with all the windows open. We were not given the reason for the power outage which in the first place, was a very rare occasion here. Not too long after, our food came. The restaurants closed its doors for new customers but let those people inside finish their meals. After we were done eating, the waitress told us with a smile that we can go and don’t have to pay, as our meal was on the house. I think with their computers off, we can’t pay with credit cards anyway. I left a generous tip on the table, both for the free lunch and for the evoked reminiscing – a sultry trip down memory lane. Sitting atop of an armoire in our living room is a set of decorative candles that were given to us as a gift, when we moved to Florida. That was about 15 years ago. When we moved to Iowa, we brought it with us, and these candles remained purely ornamental, as I don’t recall lighting them for the past 10 years or so that we’ve been here in our home in Iowa. Last night, we drove home in a torrential downpour of rain. It was raining so hard that the road visibility was reduced to a few meters, making the travel perilous. When we arrived home and got into our driveway, the automatic garage door would not open. After several attempts and failing to open the garage with the remote key, I finally went out of the car in the pouring rain, and got in the garage through a backdoor using a traditional key. That was when I discovered why the garage door would not open. The electricity was out. Power outage here in our area, or in all the US for that matter, is rare. Unlike during my younger days when I was still in Manila, where black-outs were as common as having dried fish for supper. I’m not sure what caused the power outage. Maybe it was the heavy rains. Maybe a lightning hit one of the transformers. Maybe the strong wind knock off the power lines. Maybe a deranged cow wandered in the power station. Or maybe the Martians hijacked the power plant. Who knows? But one thing for sure, there’s a lot of things you can’t do when the power is out. Can’t browse the internet in the computer. Can’t watch TV. We can’t even get in into our house! As we enter our house, we fumbled to get flashlights. It was a good thing my son has a collection of small flashlights and so we have plenty to go around. He even put on a headlamp, as he excitedly move around like a miner in a cave. It was dark, so we lit up some candles. We have a couple of aromatic candles that we use whenever we cook fish or other “stinky” Pinoy food to neutralize the smell (see previous post here). 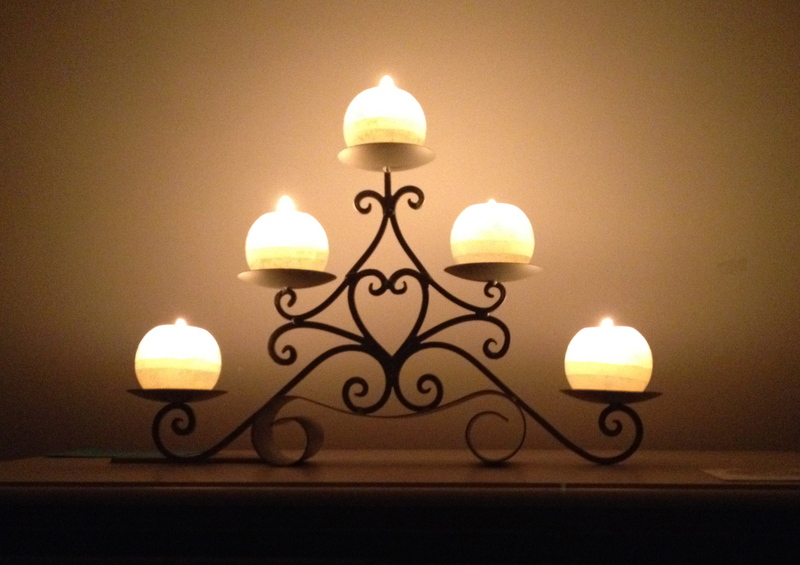 Yet the house was still dark, so I proceeded to light the decorative candles in our living room as well. That’s when my wife told me that they were “special occasion” candles only. I woke up again this morning to a more-than-usual dark room. We had strong storms overnight which could have knocked the power out, again. It was the third blackout we had in our area in the past 10 days or so. This is becoming reminiscent of my Manila days. Last week we had power outage in our clinic, and our generator was enough only to sustain minimal lighting. Since we have electronic medical records and we can only view our x-ray images through the computer screens, we were badly handicapped that we had no choice but to reschedule our patients and send them home. We cannot even practice basic medicine without electricity! We could have resorted back to paper and pens for recording, and relied more on our stethoscopes rather than on x-rays and CT scans on examining our patients. As I sat in the dark this morning in my bathroom “throne”, I pondered (can you imagine The Thinker?) on how can mankind exist without electric power. I also reflected on how we survived through medical school in Manila during the height of the blackout season…….. I used to read my textbook by the candlelight for hours, because I had no choice, as there’s an exam the following day. We used to sit in a dark lecture hall, while our professor taught in the front, and he had no idea that half of the class was asleep. And when we were 4th year medical students, we would run to ventilator-dependent patients in the hospital during power failure, and ambubagged them by hand until the power was restored (that would be keeping the patient alive by every sense of the word)…….. I was in a deep thought when suddenly a lightbulb lit up. No, I did not have a bright idea, silly. The electricity came on.